Mike Ambrose is one of the most respected men in European civil aviation. Appointed ERA Director General in 1987, under his direction the Association has become a serious player in regulatory circles. Mike joined BEA 1966. In 1974 he transferred to the then Regional Division of British Airways involved with aircraft evaluation and fleet procurement. He was later responsible for BA's network-wide User Charges and acted as a consultant to franchise partner Birmingham Executive Airways. Mike is a member of the Flight Safety Foundation's Executive Committee and has been an FSF Board Member since 1997. 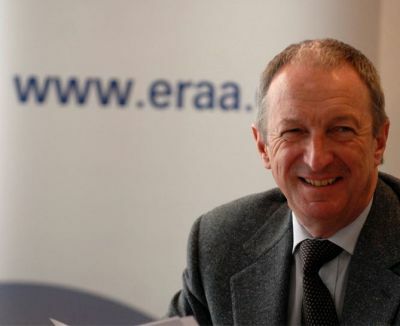 My 26 years as Director General of the European Regions Airline Association (ERA) finishes at the end of December. It has covered a time in which Europe’s air transport system has undergone enormous change in some areas but has made been unable to achieve much needed progress in others. Liberalisation of air transport started within the European Civil Aviation Conference in which States’ experts developed the inter-regional air services agreement, allowing the new routes linking Europe’s regions to major hubs and other regional points. A courageous European Commission adopted much of the thinking of ECAC’s experts and bullied Ministers and politicians into accepting the full liberalisation of air transport in 1992. New markets opened, competition was created and new business models developed. European air transport thrived. However, before long the insidious influence of State and European institutional politics resulted in air transport being treated as a blank sheet of paper on which many regulators and politicians (mostly with little real knowledge of the industry) felt it necessary to write new regulations. Consequently, Europe’s airlines have had to absorb massively increased cost burdens during the past two decades, with few real benefits for the overwhelming majority of passengers. Throughout this period, this incredibly resourceful industry has self-funded major improvements in aircraft design, training and manufacturing that has simultaneously reduced air transport’s environmental impact, increased passenger comfort and radically improved air safety. Consolidation, forced by economic circumstances on airlines, has also applied to aerospace manufacturing, especially in the regional aircraft sector. Many universally-respected manufacturers of smaller aircraft, eg AVRO/Bae Fokker, Saab, have disappeared or have become sub-contractors in larger projects. Major escalation in fuel prices have created renewed enthusiasm for more fuel-economic turboprops while restricting the operational life of small twin-jets. Europe’s major airlines, good at promoting their own products and services, have been appallingly bad at coordinated campaigning to convince Europe’s politicians, decision-makers and the general public of the social and economic benefits that air transport provides and its key role as a catalyst for growth in other industries and commerce. The EC and EU Member States should recognise that, for many of Europe’s citizens, the worst form of pollution is unemployment. The absence of widespread public and political recognition of the strategic importance to Europe of reliable day-to-day air services has been a vacuum which anti-aviation environmentalists and regulators have been only too ready to fill. Europe’s airlines’ achievements far outstrip the progress made by States in tackling strategic issues that affect the industry’s future, especially in the face of strong environmental opposition. Many States, including successive governments in the UK, pay lip service to the need to keep Europe’s airlines competitive in the global market: very few have had the courage to address the need for new capacity to overcome worsening congestion at Europe’s hub airports. Progress in unifying Europe’s airspace has been akin to the growth of stalagmites. Europe’s airline Associations first proposed the concept of a Single European Sky to the EC in the mid-1990s, but despite the efforts of successive Transport Commissioners, the goal of SES remains distant. Many States and their Air navigation Service Providers have been able to raise procrastination to an art form. The creation of the European Aviation Safety Agency provided an opportunity for consistent and efficient safety regulation but, after more than a decade of existence, no ‘road map’ exists for the Agency’s future. EASA has undertaken a range of valuable initiatives and the European Commission has initiated actions to increase its scope of responsibilities. Nevertheless, there is no plan calling for EASA and EU Member States to agree actions and targets to reduce the aggregate cost of safety regulation in Europe through economies of scale, determination and use of best practices, cooperative purchasing etc. Europe still needs an EU Aircraft Register and an EU Accident Investigation Agency, but it is doubtful EU and State politicians and regulators have the stomach to deliver such concepts. In conclusion, air transport has continuously shown creativity and resilience that has been truly inspirational but States should be aware that such resourcefulness is not infinite. Too many States, and again, especially the UK, look upon air transport as a milch cow from which inexhaustible cash can be taken to prop up government funds. Our industry is currently going through hard times. It will continue to do so for the foreseeable future. In determining future air transport policy and priorities, many regulators and politicians would be more effective if they recognised that their ears are more valuable than their voice.